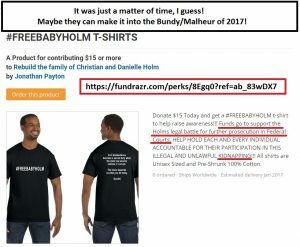 Note to Christian Holm & Danielle Holm – Repent! – Kent Hovind v. Robert Baty – The Great Debates! 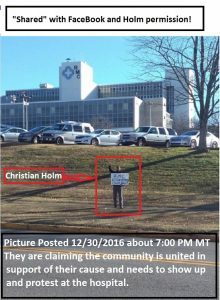 Home→Note to Christian Holm & Danielle Holm – Repent! When I tried to discuss the secret involvement of Brady Byrum in your case after hearing Ernie Land‘s announcement, you would not. You deleted my message from your FaceBook page and blocked me from your FaceBook page; which is otherwise quite public and you and FaceBook invite folks to “share” what you post there. Even your #1 promoter Jonathan Payton refused to even acknowledge that it was Brady Byrum who was secretly meddling in your case and would not discuss it. 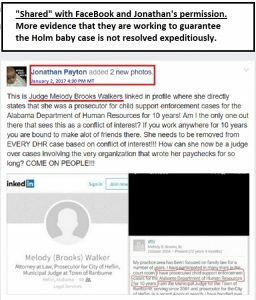 He also deleted my posts from the public #freebabyholm FaceBook group and blocked me from that group. That group has recently gone “underground” to prevent public access to what you are up to. In light of what I saw today, I thought I would take some time to again call you to repentance if having your child returned is really what you are after. There’s another much simpler explanation of the document than such as you propose above. That is, that the form was simply the available form and, should it ever be challenged in court as to its characterization, it will be reasonably shown that the signature on the line for the mother was clearly meant to simply show the person to whom the child was being released. 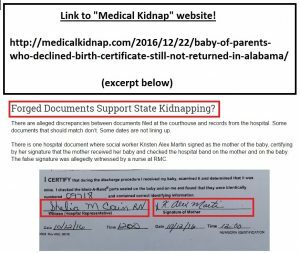 The nurse that witnessed it, similarly, might be expected to testify that she was not, in signing the form, claiming she witnessed the release to the mother but rather to the woman who signed the form as having received the baby. Really, it’s no big deal, and is certainly not what you and your promoters are claiming for it. Since that was framed as a question, I will answer with my opinion that the answer is clearly a “NO“! 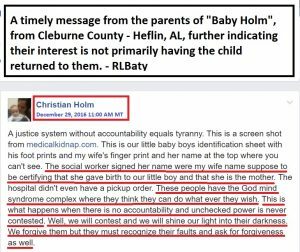 From the facts you admit to and which have been commonly reported, the State of Alabama clearly had cause for removing the child from your custody, quite unrelated to your religious and anti-government theology. You have a lot of explaining to do, in my opinion, regarding how you happened to enlist and utilize the services of Brady Byrum and so insure that you could not and would not be working towards a quick resolution of the custody issue. Repent, Christian & Danielle, repent, and bring forth works meet for such repentance. I would suggest that such works include accepting your responsibilities for the delay in resolving the custody issue. I have heard that you have now, at least, been able to enlist the services of a real, private lawyer by the name of Lisa Chasteen, who has a special interest/expertise in cases such as yours, though she seems to have a certain bias that might cause problems (i.e., did she really threaten Danielle’s mother with a lawsuit? ), and she may not fully appreciate the problems Brady Byrum created for you. Your offer of forgiveness is rather lame. YOU, Christian & Danielle, should be the ones seeking forgiveness for what you have done in placing your child at risk and refusing to deal openly, honestly and effectively to resolve legitimate issues regarding the best interests of the child. More evidence that the parents are pursuing a course not reflective of a serious interest in having their child returned. Many of us were hidden from these truths. To many it doesn’t phase you if it’s not happening to you. This mentality has to end. It IS happening to you if it’s happening around you. No one’s children are safe. And we mean no one. We must unite and stand together to save our innocent children. Please stand for what’s right, what’s just and what’s love. Byrum to meddle in your case. most in need of repentance and needing to bring forth works meet for such. loop holes within the law and most of all fear. for us to receive our hostage child back. their belief and their desires. from the basic instincts mind. becomes selfish and separate from spirit and or the creator. They know not what they do, for they don’t even know themselves. We are here to expose. So one day I stood strong and told him to stop. He did but then he caught me in the hall way and threw me some punches. I stood strong and took each one, for I knew he would now become exposed. He was expelled from school and my friend was bullied no more. punches so that justice may be found. now we all shine bright to light up the night. determined not to get their baby back. Oh yes they can and should have but failed. a warrant unless the patient agrees. It was no different from felony burglars barging into our room. 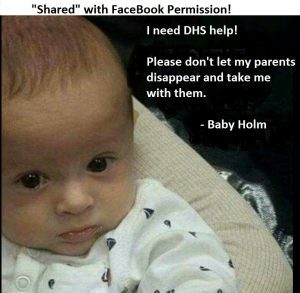 These people had no warrant to seize our baby. Nor did they have probable cause. then assuming Danielle was Daniela Ruiz. They were not even connected. catapulted the kidnapping of our 1 day old baby. on violence against social care and Cafcass staff. become harassment and what remedies are available? in life and fighting DHS was it. the truth about this mafia style organization called DHR. This has become an epidemic and must be exposed. We must unite as one. If we do not then this tyranny will come to your door. Maybe not now but in future it will someone. It’s time to stand for our rights. It’s time to unite as one love under our creator.